Great chairs. We’ve had them for almost a year and they are durable and elegant. Add classic, timeless style to your dining space with the Deana Linen and Pine Wood Dining Chairs by iNSPIRE Q® Artisan. With traditional elements like the carved pine wood framing and an arch bridge silhouette, this dining chair is sure to perfectly compliment a variety of styles from modern farmhouse to French country. The rustic wood finish pairs perfectly with your choice of linen upholstery. 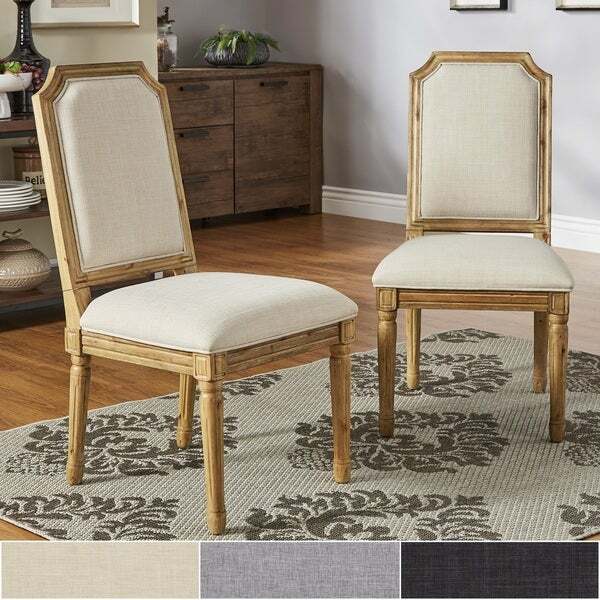 Available in beige, grey, and dark grey linen, these chairs are sure to match any color scheme. Coordinating dining table item numbers: 17190629, 17207387, 18837021, and 18845558. I never write reviews, but I feel compelled to do so for these because I am so impressed with these chairs! I ordered six of the dark grey linen option and they’re absolutely beautiful! They came well packaged and were SO easy to put together. 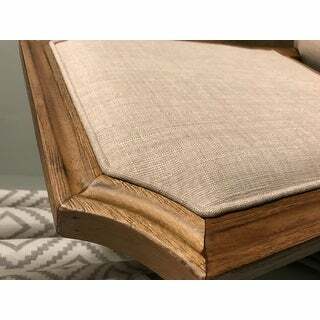 The fabric is quality, the wood is quality, they are sturdy, and they are pretty comfortable to sit in. I didn’t know what to expect from the color of the wood since there are so many variations in the pictures, but the wood turned out to be very rich in honey tones, which ended up matching our custom made table perfectly! Overall, I’m highly pleased with this purchase; they were worth every cent! The Deana Arched Bridge Linen chairs are an exquisite addition to my dining room. The linen light grey fabric is soft to the touch and the contrast of the distressed solid pine framing on the chairs looks rich. These chairs came packaged exceptionally well. The craftsmanship is superb. The cushion is beyond comfortable and sturdy and no matter the angle you place you chairs they will look stunning. Overstocks customer service team is one of the best in the business. Their response time to my need to get additional chairs and shipping was THE BEST SERVICE I have ever received and I have been in the retail industry 20 years. Absolutely FABULOUS!!!! Super picky and these are the best chairs, ever! 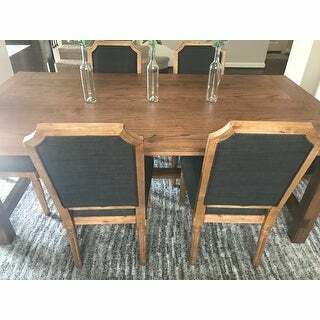 I purchased these to go with a reclaimed pine dining table and have searched high and low. They look exactly like the pic. Beige linen is like a natural linen in tone. We ordered two of dark gray chairs and they are so pretty and also very sturdy. We did not have any trouble putting them together. They are comfy and padded well. They will not show stains easily. We are very excited to entertain with these and the other two chairs we purchased on Overstock!! The wood color is so beautiful I love this chairs. 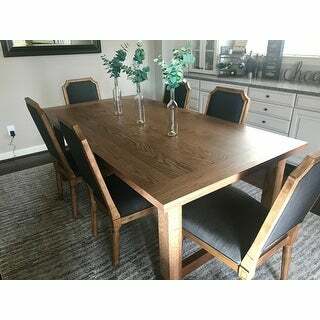 These chairs are a beautiful addition to my dining set! Great Quality. Easy to assemble! These chairs are great ! 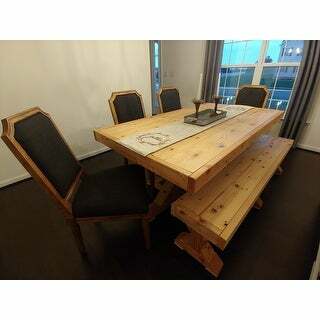 Very well made , the finish is exactly as pictured , very rustic looking . The gray upholstery is slightly darker than the picture but beautiful ! Very comfortable . Came in a few pieces but easy to assemble . Would highly recommend !!! Very pleased with these chairs so far! The quality and comfort of the chairs are perfect and exactly what I was hoping for! Absolutely gorgeous! Rustic chic! Nice quality and they match my table perfectly. They are a nice size and look great with my 60 inch round table. I love my chairs!!!! I was not expecting this great quality. Assembling was easy and the wood tone is really pretty. The linen color and material is really nice. Absolutely Lovely and easy to put together! I love these chairs. They feel very sturdy. I have gotten tons of compliments on them. I ordered a total of 4 in the dark grey and am very satisfied with my purchase. I will probably order more of them in the future. Excellent chair and matches well with my furniture...easy to put together. Highly recommend. 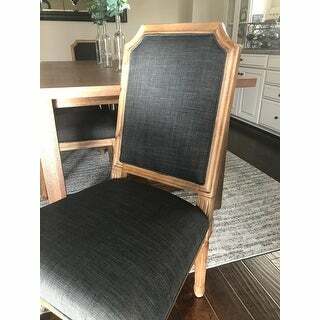 These dining chairs are absolutely wonderful. They are even great for a desk chair or accent chair in bedroom. I highly reccomend this product to other overstock customers! Nearly identical to chairs you’d find at one of the well known high end catalog and store fronts except they charge $405 per chair and that’s the “member” price. I ordered 6 chairs to complement kitchen table. Assembled easily and rave reviews from family and friends about not only the look but also the comfort! These chairs are so much nicer in person. I love, love, love these chairs!!! These chairs are so beefy and sturdy and compliment my farmhouse dining room. I love how deep the seat is. I'm 5'6" and my feet just touch the ground if I'm sitting the whole way back. The fabric is strong and the cushion is firm. Easy to put together. I sat on the chair while it wad being tightened- that stopped any wobbling. Very nice chairs and good price. Solid wood. "How many chairs are recommended for a 60” table?" "Do these chairs contain any chemicals or substances known in the state of California to cancer, birth defects or other reproductive harm?" "Hello, this item has a PROPOSITION 65 CHEMICAL NAMED WOOD DUST. Thank you"
"Does this have a matching armchair do you have another similar style with a rectangular back that have armchairs ?" Unfortunately, we do not have this item with arms or one similar. "What is the exact seat height?" The seat height 20 inches. "What is the recommended method for cleaning the fabric on the chairs?" We recommend spot cleaning the fabric.